Combine butter and sugar in the bowl of a stand mixer (or you may use a large bowl and an electric hand mixer) and beat until well-creamed. Stir in vanilla extract and salt, stirring until well-combined, and scrape down the sides of the bowl using a rubber spatula to ensure ingredients are well-incorporated. With mixer on medium-low speed, gradually add flour until well-incorporated (you will definitely need to scrape down the sides and the bottom of the bowl several times for this, as the mixture is fairly dry and crumbs tend to settle at the bottom of the bowl). Transfer dough to clean surface and use your hands to form it into a cohesive ball. Flatten into a disk (about 1" thick), cover with clear wrap, and chill for 15 minutes. Preheat oven to 350F (175C) and line cookie sheets with parchment paper. Set aside. Once dough has chilled, transfer it to a clean, lightly floured surface and use a lightly floured rolling pin to roll out to 1/4" thickness. Lightly flour your cookie cutters and cut out your shapes, transferring them to ungreased cookie sheet. Once you have cut out all of the shapes that you can, be sure to re-combine the scraps and roll out and cut out again to get the maximum number of cookies from your dough. Bake on 350F for 10-12 minutes (this is how long it took me to bake my 2" heart cookies, you may need less time for smaller cookies or longer if you are using larger cookie cutters -- look for the edges to be just beginning to turn lightly golden brown) and allow cookies to cool completely before dipping in chocolate. Prep chocolate by placing dark chocolate melting wafers in one bowl and white chocolate melting wafers in another and preparing according to package instructions. Once chocolate is melted, line a cookie sheet with wax paper and, firmly holding the base of each cookie, dip the surface into the chocolate. Immediately after dipping, place on wax paper lined cookie sheet (chocolate side up) and immediately sprinkle with nonpareils/sprinkles. 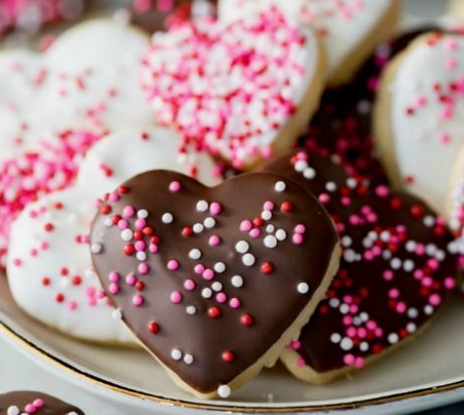 Repeat, alternating with white and dark chocolate, until all cookies are covered with chocolate. 0 Response to "Valentine Cookies"